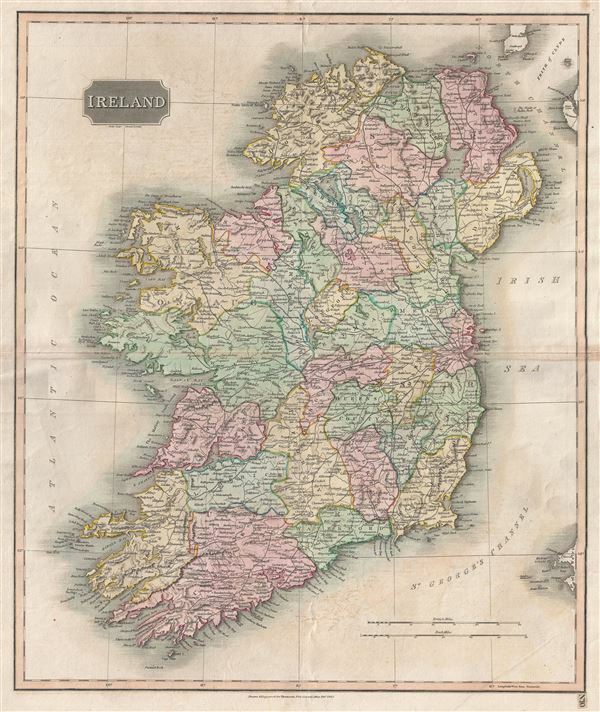 This is an attractive example of John Thomson's 1816 map of Ireland. The whole is beautifully engraved in the minimalist English style pioneered in the London and Edinburgh during early part of the 19th century. It depicts the entire Emerald Isle, divided into 32 counties, covering from Donegal in the north to Cork in the south. Towns, rivers, mountains, railroads, and various other important topographical details are noted. Elevation throughout is rendered by hachure and political and territorial boundaries are outlined in color. In 1801, the island of Ireland became part of the United Kingdom of Great Britain and Ireland. Though Britain flourished during the 19th century, Ireland suffered a series of famines, the worst being the Great Irish Famine, which lasted from 1845 - 1849 and killed about a million people. As a result Ireland experienced a widespread exodus - mostly to the United States. By the end of the 19th century, almost 50% of immigrants into the United States hailed from Ireland. This map is a steel plate engraving by Samuel John Neele and was prepared by John Thomson for inclusion in the 1815 edition of Thomson's New General Atlas. Samuel John Neele (July 29, 1758 - May 13, 1824) was a prolific British map engraver active in the late 18th and early 19th centuries. Neele apprenticed as a printer and engraver with Harry Ashby from about 1781 to 1782 before establishing himself independently in 1785 at 352 Strand, London. The combination of business acumen and technical skill make Neele extremely successful with literally hundreds of maps to his credit. His vast corpus is composed of notable maps by most major English publishers of the period including, Haywood, Faden, Wallis, Stockdale, Arrowsmith, Thomson, and Greenwood, among others. Neele's sons, James and Josiah Neele, also engravers, took over their fathers business around 1818, both becoming notable in their own right. Thomson, John. A New General Atlas, (London) 1817. Good. Minor toning on original centerfold. Platemark visible. Blank on verso. Rumsey 1007.011. Phillips (Atlases) 731. Newberry Library: Ayer 135 T4 1817.